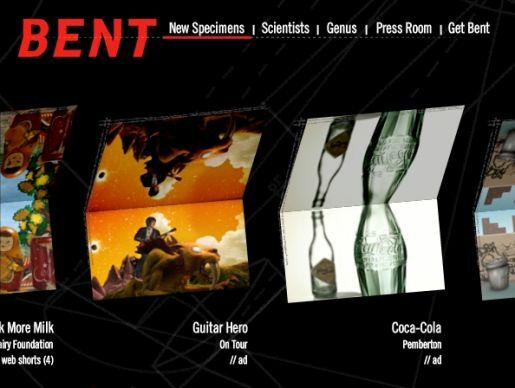 Bent Image Lab, www.bentimagelab.com,today’s site of the day, is an animation house and hybrid live action production studio headquarted in Portland, Oregon, founded in 2002 by Chel White (ex Curious Pictures), Ray Di Carlo and David Daniels (Vinton Studios). The directing team has since been joined by Jun Seo Hahm, Paul Harrod, Rob Shaw, Pascal Campion, Daniel Garcia, Ghostbot, Robin Willis, Randy Wakerlin and Carlos Lascano. The Genus tab provides a selection of the work done since 2002, in categories of Stop Motion, CG, 2D, Mixed Media, Paper Cut Out, Character, Live+, Inanimation, Strata-Cut, Music Videos and Short Films. See our review of Chel White’s direction for the Harrowdown Hill music video for Thom Yorke.